This Halloweentide, a new spoopy show graces us with its presence: Scream Queens. Ryan Murphy has once again blessed/cursed us with yet another television show; the font of his creative juices is ever-giving. 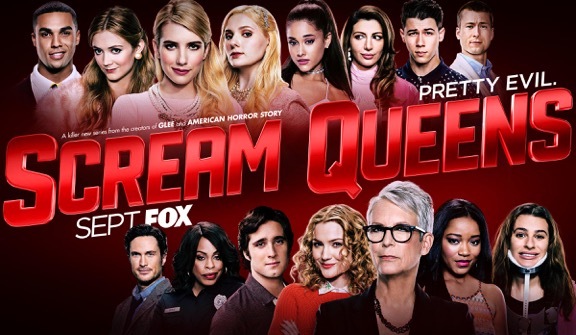 As an avid American Horror Story fan, I was excited but also scared—frankly, I was worried Scream Queens would be AHS Season 5, because there were rumors of AHS going in a “different direction” this year. Thankfully, this was unfounded as American Horror Story: Hotel has premiered in all its provocative, disgusting psychosexual glory that we all love to be horrified and appalled by. As it turns out, Scream Queens is an entirely different beast than AHS. In its tongue-in-cheek, girl-power feel, you can see a sort of line of inheritance from AHS: Coven, the show’s third season. But take Coven, add in liberal doses of slasher flicks like Scream and Halloween, then multiply exponentially by Mean Girls, and you get an idea of what Scream Queens is like. Let’s take a closer look after the jump. Spoilers for the first season so far.